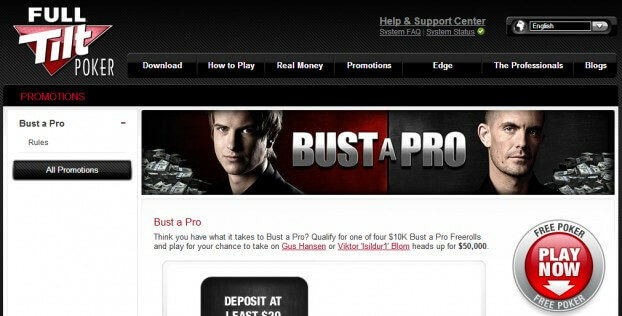 Full Tilt Poker has announces a new promotion called Bust a Pro which will give players the ability to challenge Gus Hansen or Viktor ‘Isildur1’ Blom in a heads up match for up to $50,000. Players who want to take part will need to battle it out for the heads up spot by choosing between the Gus Hansen or Isildur1 Bust a Pro Freerolls. Each of the freerolls will feature a $10,000 prize pool and a total of four will be offered. The winner of the four freerolls will then go on to challenge either Gus Hansen or Isildur1 heads up on January 5th for up to $50,000. The heads up play will feature three rounds with round one offering $5000. The second round will feature $15,000 and for player who make it to round three they face a choice – risk the additional $15,000 secured in Round 2 to play for the $50,000 grand prize, or walk away with $20,000. Sarne Lightman, Head of Marketing at Full Tilt Poker had the following to say about the Bust a Pro promotion. Bust a Pro is a really exciting opportunity for our players to test their skills against the biggest names in poker. Not only do they have the chance to take on one of The Professionals, but they can win up to $50,000 in the process!